Oops - we don't appear to have a video for the DocuMate 520. We bought the Xerox Documate 520 to move towards a paperless office as we can link scanned documents to customer’s records in our Sage and Management information systems. The Xerox is well built and the software enables you to save directly to a PDF which is what we wanted. Speed is good and the document feeder is a must. The software as a whole is not particularly intuitive, but it is OK once you get the hang of it. The Visioneer Xerox DocuMate 520 document management scanner is a compact and effective hi-speed scanner perfect for workgroups and other decentralized scanning applications. By eliminating seldom used options such as duplex capability and a SCSI interface, Xerox offers this model at a price that enables businesses to achieve high levels of productivity by distributing fast cost-effective scanners throughout the organization. 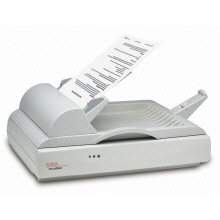 The DocuMate 520 has a 50-page Automatic Document Feeder that scans 20 pages per minute. It features 600x1200 dpi optical resolution, 48-bit color, Hi-Speed USB 2.0 interface and scans everything from photos up to legal-sized documents. It also features one of the smallest footprints available of any business-oriented flatbed scanner on the market. The DocuMate 520 includes TWAIN and Certified ISIS® Drivers plus the following software. PaperPort Pro 9 Office is the easiest way to turn volumes of paper or photos into organized digital files that you can quickly find, use and share. PaperPort's native support for the standard PDF format brings you the power to scan, annotate and email documents and photos in a format that ensures everyone can view and print them on any computer. Stop wasting time looking for paper documents scattered around your home and office. TextBridge Pro 9.0 by ScanSoft quickly turns scanned documents into editable, formatted text. You can use the text in virtually any word processing, desktop publishing, or web publishing program. QuickScan (Demo Version) is a standalone, out-of-the-box imaging solution that provides all the necessary capabilities for high-speed ISIS® based scanning, image enhancement, viewing, annotation, and printing of images for both black-and-white and color pages. Developed by Pixel Translations, the creators of ISIS, QuickScan's strengths include features such as batch scanning, PDF support, image manipulation, multipage support, and more. Kofax' VirtualReScan is an award winning, patented technology that automatically insures the best possible quality for scanned document images. As quickly as pages pass through the scanner, VRS performs a multi-point inspection of each document. VRS instantly checks and adjusts for alignment (skew), brightness, contrast, and image clarity. Any inconsistencies are immediately corrected by VRS so that only the straightest, most readable images are moved into your application.